This section starts with Kundalini Yoga Master Teacher Gian Kaur Khalsa and ends with Guruka Singh Khalsa. Legacy Teachers are all of those early students of Yogi Bhajan who sat at his feet, who were personally chiseled by him, and who deliver his teachings today. Until recently, this crusty group of graying middle-agers and senior citizens was affectionately referred to as "the old-timers." SS Gian Kaur Khalsa aka Marisa Maraldi Velasco, Born in Brazil, she first came to practice Kundalini Yoga with the Master at the Amsterdam Ashram. Her first meditation was Long Ek-Ong-Kars for 2.5 hours. Yogi Bhajan sent her to Guadalajara, Mexico where she founded a center, which is now over 25 years teaching and training new teachers. KRI Certified Kundalini Yoga Teacher Music Teacher. Guruatma Kaur Khalsa has been teaching since, 1978 and has created a new yogic program for chronic and critical illness. She has walked through the long, dark night of the soul, and knows how it feels to suffer though the intense loneliness that can accompany a chronic or critical illness. Guruatma also offers Chair Yoga classes with the City of Houston and yoga presentation to interested groups. She created a program called Yogic Tools for Chronic and Critical Illness: 6 Stages and 22 Steps. The program focuses on how simple yogic practices can help alleviate the physical and emotional suffering that comes from serious illness. The program provides guidance and support for people who are navigating a chronic or critical illness; and for their loves ones. Once a month, she offers a free teleseminar giving an introduction to the program. She is a member of the International Association of Yoga Therapists, a KRI-Certified Kundalini Yoga Teacher and Chair Yoga Instructor. Guruatma currently lives and teaches in Houston, Texas, but her clients are spread all over the globe, thanks to the world-wide web. Guruatma Kaur Khalsa, has been teaching Kundalini Yoga since 1979 and is certified by IKYTA. She is lovingly dedicated to encouraging each student to release and relax into the True Self. Guruatma teaches throughout the Metro west area and brings great joy, energy and inspiration to her classes. Guruatma Singh Khalsa, M.Ed, D.Ay, ERYT 500, is an international teacher who has been teaching for 30 years. He began his teaching career in the 70's instructing Hatha Yoga and began to focus on teaching primarily Kundalini Yoga in the early 80's. He is a Reiki Master Teacher, Neurolinguistic Programming, and Hypnotherapy. His class is a twelve year tradition at the Yoga Center and is a great way to deepen your practice and tap into your creative source. He has a Masters degree in Ayurvedic Medicine, has been a stress consultant for Tufts University. Guruatma Singh is a Wellness Coach and Psychotherapist who has served as a Stress Management Consultant at Tufts University Graduate School, where he has taught yoga and meditation for the past 15 years. Guruchander Singh Khalsa, Yogi, DC, began studying yoga with Yogi Bhajan in 1972. He moved to Espanola in 1976 and began serving as one of his healers. He has been practicing and teaching Kundalini Yoga throughout the U.S. for more than 30 years. Guruchander received his BA in Business Administration from Southern Methodist University in Dallas in 1972 and his Doctor of Chiropractic degree from Pasadena College of Chiropractic in Pasadena, California in 1982. In addition to his training in chiropractic, he has studied many forms of alternative healing since 1972. Guruchander possesses a personal passion for teaching people how to reach their potential and connect with their own souls. He has the ability to "prescribe" the tools you need to help you walk that road back into yourself with courage and grace. Dr Guruchander is the founder of GRD Health Center in the beautiful Espanola valley in Northern New Mexico. Under his experienced guidance the center has blossomed into one of the leading cooperative alternative healing centers in Northern New Mexico. Gurucharan Singh Khalsa, Ph.D. is the Director of Training of the Kundalini Research Institute. He is a psychotherapist, teacher, writer and world recognized expert in Kundalini Yoga as taught by Yogi Bhajan. Gurucharan is an authority in the mind and in the applied psychology of meditation and peak performance. For 25 years he was in clinical practice with his focus being on executive coaching, conflict resolution, stress management, creativity and the interface of high information technology with optimal human performance. He bridges two perspectives: the hard sciences, which he learned in mathematics and chemistry at Harvey Mudd College and graduate mathematic studies at Claremont Graduate School; and the human sciences, which he studied at Boston University for a Masters in counseling. He later completed a doctorate in psychology. Gurucharan is an educator and has instructed in universities, including MIT and the University of Guadalajara, for over 20 years and has been affiliated with the Center for Psychology and Social Change at Harvard University. He has done original research on the cognitive and physiological impact of meditation, and has designed social programs. He speaks and writes on the use of yoga techniques for therapists, health care providers and organizations. In addition, he has trained thousands of yoga teachers and conducts classes and seminars in Kundalini Yoga around the world. Gurudass Kaur has been practicing and teaching Kundalini Yoga for over 35 years. She is a KRI certified Level I and Level II teacher trainer. She is a Certified Yoga Alliance member at the ERYT level (Experienced Yoga Teacher). Her knowledge is deep and she has a unique capacity to share and transmit the Kundalini yoga tradition techniques clearly and correctly with kindness and joy. She has a beautiful voice that vibrates in the room and touches the heart when she sings. She has the capacity to unfold the mantras and make their meanings and how to use them clear and inspirings. As a musician and singer she has recorded many mantra CD's such as Adi Shakti, Circle of Light, Longing to Belong, Asankh Nav, Enchanted and her lastest album called 'Lovingly, Gurudass Kaur'. She also has a celestial communication DVD called Mantras in Motion. She is also heard singing in many well known Kundalini Yoga music recordings. Gurudass Kaur has been a Kundalini Yoga student, and teacher since 1972 and co-founded the first Kundalini Yoga center in Barcelona, Spain in 1978. She had the privilege of studying directly with the Master of Kundalini Yoga, Yogi Bhajan from 1972 until his passing in 2004. She lived in Barcelona for 25 years where she taught Kundalini Yoga and held teacher training courses. After moving back to the United States she now travels internationally offering Level I and Level II Kundalini Teacher Training programs. 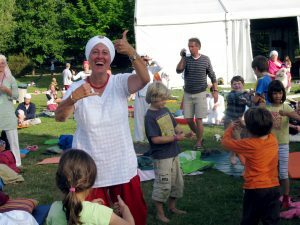 Gurudass Kaur is also the creator of the Childplay Yoga training program, an innovative yoga based, fun and creative activities program for children. She brings to this program her years of work as a certified elementary school teacher and a Montessori teacher. She also founded the Aerobic Federation of Spain and for many years trained students to become Aerobic teachers. Her big heart and gift with people have placed her on the forefront of many 3HO events, both in Europe and the USA. She is the assistant program director for the 3HO Yoga Festival in France that is held annually for the last 32 years and helps out as often as possible at both the Summer and Winter solstice events in the USA. Gurudass Kaur presently travels worldwide with her Childplay Yoga program and Kundalini Yoga teacher training programs, Level I and II. She also offers Mantra workshops, concerts and kirtans. She presently lives in Northern Virginia, USA. Gurudass Singh met his spiritual teacher, Yogi Bhajan, in November 1971 at the age of 17 years. In 1977 his teacher asked him to go to Barcelona (Spain) to introduce the teachings of Kundalini Yoga. Gurudass for 25 years taught in Spain. A community of teachers of Kundalini Yoga grew under his leadership. In January 2001 Gurudass began a new phase in his life as a teacher. Yogi Bhajan asked him to henceforth be devoted exclusively to travel the world, taking his teaching and sharing his music. Gurudass in addition to teaching has been a Tantric healer and numerologist with great success, publishing several books on the subject. Since then he has traveled and taught among others in India, Chile, Argentina, USA, Spain, Mexico, Colombia, Singapore, Britain, Sweden, France and Puerto Rico. Gurudass been visiting India since 1974 and has organized a number of Yatra (spiritual pilgrimage) in recent years. In 2005 he organized the first Latin American yatra Kundalini yogis of India. Gurudass is a dedicated and talented musician who has written many spiritual songs and beautiful melodies has given dozens of ancient sacred mantras. His CDs are known internationally and is heard in Kundalini Yoga classes around the world. CDs: Adi Shakti, Asankh Nav, Circle of Light, Longing to Belong, Enchanted, Train to Amritsar, Flowers in the Rain. He founded the Spanish Association of Kundalini Yoga and the European Festival of 3HO Yoga, where he continues working and teaching each year. Director of the International College of Kundalini Yoga, Santiago, Chile; KRI Certified Level 1 and Level 2 Teacher Trainer; Member of KRI-TTEC (Teacher Training Educational Council). 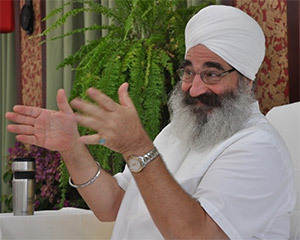 Gurudatta Singh has been teaching Kundalini Yoga since 1973 and has participated in training yoga teachers since 2001. He has worked in a variety of our community businesses, from managing a "Golden Temple Conscious Cookery" in the 70's to representing our natural food lines, Yogi Tea and Golden Temple Cereals in the 90's through 2005. After teaching and marketing yoga courses for a studio in Santa Fe, He joined KRI in the summer of 2007. MSS Guru Dev Singh, Ph.D is the pre-eminent healer and Teacher of Sat Nam Rasayan®. He is acclaimed in the Americas and Europe as one of the greatest healers of our time. People come to him from around the world to be healed and learn to heal. Guru Dev Singh, for more than a quarter of a century, has combined the ancient Mayan, Toltec and Curandero traditions of Mexico with Kundalini Yoga and Yogic Healing. His center in Rome, Italy, is renowned for producing some of the finest healers in Europe. In 1978, Guru Dev Singh began studying Sat Nam Rasayan® in the traditional way, in silence and seated beside his master, Yogi Bhajan. It was this same master who asked Guru Dev Singh to find a way of teaching this method widely, employing a means that would be accessible to all. Since 1988, he is the master of this method of treatment. He founded the School of Sat Nam Rasayan® in Rome and the Foundation for Sat Nam Rasayan® in Amsterdam and The Center for Contemplative Awareness. He travels the globe teaching healing, meditation and Kundalini yoga. Excerpt from "Sat Nam Rasayan® The Art of Healing" is a healing art that is based on consciousness that has the capacity to become transcendent, to modify the environment. We don't use tools, we use consciousness. Sat Nam Rasayan® is a very simple system. It is based on the quality of the human consciousness that allows it to become transcendent. Transcendent means that just through your awareness, you can produce an effect in an event, in an object. We make our own consciousness stable. We recognize there is a space we call the Sacred Space. We relate with that specific space and then by moving our awareness, we modify the relation, and we modify the event in some way. It teaches a surprisingly simple way to inner silence. Starting at about 12 years old, I found my mind asking me a recurring question. What would I be doing when I was 23 years old? I thought this question had to do with what type of work career I would be embarking on. But as it turned out, God had a plan different than mine. In August 1971, at the age of 23, I began my practice of Kundalini Yoga. Interestingly enough, my initial exposure to Kundalini Yoga was sadhana in the early morning hours. I did sadhana for over 40 days before ever attending a regular class. Through these first 40 days, a habit was set that has lasted till this very day: Get up before the sun rises, consciously breathe the breath of life; let this deep, rhythmic, relaxed breath go through the body's meridian points to bring the life force and its energy into my system. In other words, activate the Pranic or Eighth Body to bring life's electricity. The results of this habit were immediate. Although I always had 'energy,' my energy was now even stronger and more focused. Things that used to disturb me bothered me less. As time passed, my doubts and anxieties began to subside and I found myself becoming more and more neutral in my outlook. I also felt my fears dropping away! After several years, I understood how blessed I was to have received the gift of conscious breathing through Kundalini Yoga. MSS Gurudhan Singh in August 1971, he was practicing martial arts 4 days a weeks (that lasted 23 years), became the Solstice Camp Director (to this very day), taught Kundalini Yoga every week (still). Guru Dharam Singh Khalsa, BAcC RCHM has 30 years experience of chanting, of teaching the science of sound and of its therapeutic applications in Kundalini Medicine. The disciplines of Naad, Laya and Mantra yoga all have their place in awakening Kundalini Shakti because the Rishis of the ancient world understood how sound affects the psyche and modifies the character. He has taught Kundalini yoga since 1980 and been practising Oriental medicine since 1988 when he founded the Lotus Healing Centre, London and served as the Vice Principal of the London Academy of Oriental Medicine. As a Keynote speaker on matters of health, vitality, emotional intelligence for Association of Chief Executives in the UK, 2002-2005, Guru Dharam served as an educator to the business and corporate community. Guru Dharam founded the International School of Kundalini Yoga in the UK in 1996 (with Darryl O'Keeffe his co-author of 'Kundalini the Essence of Yoga') teaching people to become yoga teachers. He lead trains in Sweden, UK, Ireland, Israel, New York, Malaysia. He also teaches and practices in Germany. Guru Dharam is the course Director of the International Kundalini Therapy Training held in Sweden. and an associate Director of the Institute of Medical Yoga, Stockholm. He trains yoga teachers and healthcare professionals to apply the principles of Kundalini Yoga and Meditation in a therapeutic context for challenging modern conditions. For example he has developed programmes for anti stress burn out and attention deficit disorder. The Shabd Guru - or the articulation and vibration of sonic forms - is the key to the portal of higher consciousness in the Aquarian Age. And it is available to all of us. Consultations with Guru Dharam, for optimal health and effective life transitions. Kundalini yoga therapy, Feng Shui, Tibetan White Lotus healing, Chinese herbal medicine and acupuncture including Face Toning acupuncture. WE are now available for SKYPE consultations. Guru Fatha Singh Ph.D. met Yogi Bhajan, master of Kundalini Yoga and spiritual director of the 3HO Foundation when he was 17. He is the founder and senior member of the Toronto Kundalini Yoga Teachers Association. Ordained as a minister of the Sikh faith in 1987, Guru Fatha Singh became a chaplain at the University of Toronto in 2000. In 2002, Guru Fatha Singh founded Peace Week, a yearly forum and celebration dedicated to realization of a sustainable culture of peace at Canada's largest university. The biography of Yogi Bhajan, which his teacher commissioned him to write in 1983, is posted, chapter by chapter, on his blog each month. That project is still in the process of being added to and written, month by month. Guru Fatha Singh's latest project FIVE PARAGONS OF PEACE: MAGIC AND MAGNIFICENCE IN THE GURU'S WAY takes Yogi Bhajan's naming of Guru Nanak, the first Sikh Master, as "Guru for the Aquarian Age" and develops the idea, finding parallels and synergies around the world. GuruGanesha, has practiced yoga and meditation for over 30 years under the guidance of his spiritual teacher, Yogi Bhajan. In 1972, GuruGanesha took his first, life-changing Kundalini yoga and meditation class. GuruGanesha Singh is also founder and CEO of the Sandler Sales Institute of Virginia. He is considered to be one of the world's premier high tech sales training experts with clients that include Computer Associates, Cisco Systems, BMC Software, and Cognos Corporation. In 1999, GuruGanesha founded Spirit Voyage Music and performs over a hundred musical performances per year, in addition to teaching yoga classes and prosperity workshops, and recording new music, Pure Ganesh and Grateful Ganesh. Guru Jiwan Kaur has been teaching Kundalini Yoga since 1986. Since 1995, she has been a member of the Italian Khalsa Council and in 2002, given the task of creating European Community Development. Guru Jiwan Kaur is a member of the 3HO Europe Advisory Board and works closely with the 3HO, 3HO International and PR in Italy. Guru Jiwan Kaur created the Kundalini Yoga Center of 'Shakti', in 1987 in Trastevere, and in 1990 moved to its present location, in Via dei Brusati (Aurelio Monteverde area). She paid particular attention to issues associated with the yogic vision of evolutionary psychology, teaching and studying in depth many facets of the teachings of Yogi Bhajan brought from Umanologia, with particular attention to the teachings aimed at women, couples and children. In 2008, together with Datta Kaur, a teacher of Yoga for Children, Guru Jiwan Kaur conceived and organized the school YOGA TO GROW and started the first Training Course for Teaching Yoga to Children and Youth based on the teachings of Yogi Bhajan and modern theories of evolutionary psychology, and open to certified teachers of Kundalini Yoga and the industry-pedagogical education. Sat Nam Rasayan Personal Treatments and classes of level 1 and 2. Founder and activities coordinator of Centro Yoga Shakti, since 1990 Kundalini Yoga & Sat Nam Rasayan center in Rome, Italy. Guru Jiwan Singh was first introduced to 3HO Kundalini Yoga as taught by Yogi Bhajan in 1970 and has had the opportunity to study under Yogi Bhajan directly who was an internationally known Master of Kundalini Yoga, Master of White Tantric Yoga, and Master of Ayurvedic Medicinal Herbs, with a Ph.D. in Psychology. Guru Jiwan Singh's background involves 34 years of experience in practicing and teaching Kundalini Yoga, 12 years of experience practicing and teaching Gatka Martial Arts, 18 years as a Professional Massage Therapist, Doctor of Cymatic Bio Energetic Medicine, and 13 years experience as an Organic Whole Food Nutritional and Ayurvedic Herbal Consultant. Guru Jiwan Singh is a Master of Yogic Skeletal Therapy, a healing yogic bodywork. Presently, Guru Jiwan Singh is the only Practicing Master of this Therapy. It is a most unique Yogic Massage Technique and unlike any other form of bodywork most people have ever seen or heard of. Skeletal Therapy is thousands of years old and has saved the lives of many thousands of people. It is a form of Yoga Therapy which works on stimulating and balancing the acupressure points located along the meridians or lines of energy in the body, (also used in acupuncture), adjusts the bones and completely de-stresses the entire body in one treatment. Guru Karam (Laura) has been a yoga practitioner for over 25 years. As one of the first certified Kundalini Yoga Teachers, she has served as a teacher training course facilitator in the Master's Touch program taught by Yogi Bhajan and has directed teacher training courses since 1997 at both Level I and Level II. In addition to her Kundalini Yoga certification, Guru Karam also has certification and advanced training in Integrative Hatha Yoga Therapy and teacher training in Ashtanga Yoga. She brings a lively sense of humor to the profoundly transformative practice of Kundalini Yoga with a focus on ease and precision in postures and the breath. Guruka Kaur has been teaching since 1971. She is the Executive Director of the International Kundalini Yoga Teachers Association (IKYTA) and a member of the Global Advisory Team for IKYTA. She connects with Kundalini Yoga teachers all over the world on a daily basis and has devoted herself to the global community of KY teachers. MSS Guruka Singh Khalsa is a teacher, writer and inveterate punster. In this incarnation, he met Yogi Bhajan in 1971, began teaching Kundalini Yoga and meditation, and has taught ever since. From 1971-1974 he lived and taught in New York City. From 1974-1989 he served as the head of the 3HO Ashram in Columbus Ohio, and from 1989-1992 he taught and created computer game software in Oakhurst California. Known by many as Doctor Hi-Fi, he loves to play with electronics, computers and words. In 1982,Yogi Bhajan asked me to gather together all the poems he had written in Gurmukhi and translate them into English. The result was a book titled "Furmaan Khalsa" ( the command of the Khalsa.) as well as translating Japji Sahib and more. He is the author of "The Self-Sensory Human" yoga manual. Guruka Singh served as editor of a new collection of poetry written by the Siri Singh Sahib, Yogi Bhajan, this volume is a compilation of all his poetry written in English and it is called, "The Game of Love." He now lives in Espanola, New Mexico where he teaches through his Youtube list on this site and travels around the world. He and his beloved wife Guruka Kaur were married at Summer Solstice 1971 and have hundreds of children all over the world. He is the executive director of SikhNet and MrSikhnet.